Automated Infrastructure Management Solutions Market size is set to exceed USD 3.5 billion by 2024; according to a new research report by Global Market Insights, Inc. The automated infrastructure management solutions market is predicted to grow over the forecast timespan owing to the rise in demand for intelligent cable management software tools for managing connections in infrastructure facilities. High-density servers and converged infrastructure result in the generation of abundant power and energy, which affect the performance of electrical devices and cables. These software tools provide effective management of the cables and ensure the real-time connectivity of the devices in the patch ports. Moreover, the deployment of high-capacity network devices and servers has complicated the cabling structure, thereby driving the adoption and demand for such tools. The adoption of advanced technologies and devices has resulted in increased connections and network structure, propelling the market demand. The growing need for the renewal and upgrading of the existing network in developed markets is expected to drive automated infrastructure management solutions market growth. Rising technological advancements and innovations are encouraging the adoption of new technologies that will enhance the performance of the business operations. The integration of advanced systems and devices is complicating the network structure, thereby making it difficult for the operators to manage and monitor the cabling structure. These automated solutions help in reducing the time and efforts of the network manager, improving the reliability and efficiency in infrastructure management and positively impacting the market size. In the IT & telecom industry, the tools help the operators in providing the status about the device functioning and operations. The real-time view of the physical network connectivity alerts the network administrator of any unplanned connection or disconnections in the facility. Detailed reports and mapping of the network structure are provided by the solutions, which help the operators/managers in examining and detecting the malfunctioning of any components. Automated features of the software tools, such as installing, updating, and configuring the device connectivity in the cable ports, are expected to drive the demand for the automated infrastructure management solutions market. In the automated infrastructure management solutions market, device discovery tools are helping in maintaining an accurate real-time connectivity amongst the database of physical layer components and active equipment. Massive data generation has subsequently led to a rise in demand for innovative tools that provide enhanced maintenance. Moreover, the industry is witnessing a rise in the demand for high-speed connectivity thereby driving the need for advanced networking and communication solutions. The features provided by these solutions include real-time infrastructure monitoring, performance management, and automated remediation, which help IT companies in achieving the faster restoration of service with less human errors, thereby driving the automated infrastructure management solutions market demand. The rise in population and urbanization in several Latin American economies, such as Brazil, Argentina, and Mexico, has led to the mounting pressure of managing the data generated. The tools are helping improve the overall management of commercial buildings, central offices, or data centers by monitoring all physical connections, thereby driving the demand for the market. The infrastructure adopted by the government entities provides several advantages such as high-speed connectivity and service delivery reporting. It offers a centralized facility to provide basic monitoring services and essential hosting for government entities. The solutions adopted provide physical security for the servers, storage, and network equipment connected to the network. Increasing demand from citizens for improved transparency and accountability will fuel the demand for automated infrastructure management solutions market from the government sector. 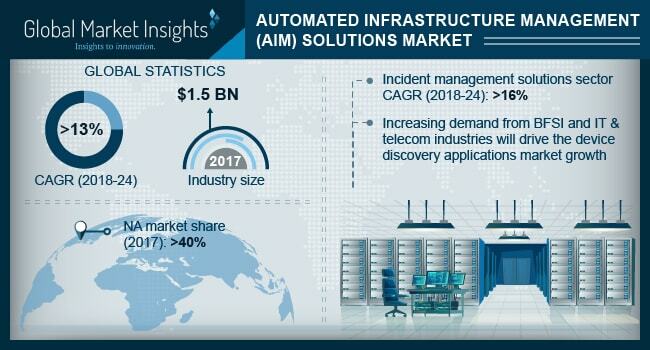 Major players operating in the automated infrastructure management solutions market include Anixter International, CommScope, Inc., CA Technologies, Cisco Systems, Inc., Furukawa Electric Co., Ltd., Fujitsu Ltd., Fiber Mountain, Inc., Ivanti, IBM Corporation, METZ Connect, PagerDuty, Nexans, Microsoft Corporation, Reichle & De-Massari, Panduit Corporation, Hewlett-Packard Enterprise, RiT Tech (Intelligence Solutions) Ltd., Rittal GmbH & Co. KG, TE Connectivity, and The Siemon Company, among others. The players in the market are developing new and advanced solutions for competing in the market. For instance, in February 2018, Fiber Mountain, Inc. announced the launch of Sensus, which is a patch panel used for gathering the real-time information with the use of cables and connectors. Moreover, companies are targeting their offerings in countries, where a high demand for the solutions is being witnessed.